“Brother Al” Helfer was the everyday voice of baseball in small-town America and around the globe. As the lead announcer on the Mutual radio network’s Game of the Day from 1950 through 1954, he covered more miles than any scout. His pioneering work earned him recognition in 2019 as the Ford C. Frick Award recipient for baseball broadcasting excellence. He was popular with sponsors and their ad agencies because he delivered their commercials with conviction. When Helfer said Gillette Blue Blades would make a man “look sharp, feel sharp, be sharp,” he sounded like he believed it. That talent kept him employed as a high-level baseball and football announcer, covering many marquee games for nearly two decades. George Alvin Helfer Jr. was born on September 26, 1911, in Elrama, Pennsylvania, about 25 miles outside Pittsburgh. The first of two sons of George Helfer, an engineer for the Pennsylvania Railroad, and the former Margaret Pritchard, he grew up a few miles away in Monongahela. Young Al was athletic as well as big. He played fullback for the Generals of Washington and Jefferson College while also lettering in baseball, basketball, and track and field. He entered medical school at the University of Pittsburgh, but dropped out after a year for lack of money. Joining the Pittsburgh Post-Gazette as a sportswriter, he broadcast Pitt football and re-creations of some Pirates games over the paper’s radio station in 1933. Helfer’s first big break came in 1935 when WLW and WSAI in Cincinnati hired him to work on the Reds broadcasts with Red Barber, who began calling him “Brother Al.” Cincinnati wasn’t big enough to hold Helfer. Two years later he moved to New York’s WOR, the eastern flagship station of the Mutual network, to cover college football and announce prime-time entertainment shows. New York’s three baseball teams had agreed to a radio blackout so their broadcasts wouldn’t compete with the other clubs’ home games. When Larry MacPhail moved from Cincinnati to run the Brooklyn Dodgers, he brought Barber with him to end the blackout in 1939. WOR carried the games and assigned its announcer, Helfer, to work with Barber. But the ambitious “ol’ Redhead” (who was just 31) ruled the booth. He allowed Helfer only one inning, the fifth, as he set about making himself a Brooklyn icon. Helfer left the Dodgers to join the navy soon after Pearl Harbor. By this time he was divorced from his first wife, Agnes Charney; they had a son, George. Helfer saw combat during the Allied landings in North Africa and commanded a PT boat in the invasion of Sicily in 1943. He was rotated back home in time to marry again on June 14, 1944. His bride, Estrild Raymona Myers, was a jazz pianist and singer who used the stage name Ramona. She had performed with Paul Whiteman’s orchestra and had several hit records in the 1930s. Twice divorced, the 5-foot-10 brunette was every bit as strong a personality as her new husband. She quit show business to raise their daughter, Raymona, who was born the next year. This was not an original idea. An upstart Texas station owner, Gordon McLendon, had proved the concept with re-creations of big-league games from a Dallas studio over his Liberty network. McLendon ignored such niceties as rights fees and territorial exclusivity; he put the games on the air and dared the majors to stop him. Liberty claimed a weekday audience of 2 million listeners, primarily in the West and South. The baseball commissioner’s office jumped at Mutual’s offer to pay for daily broadcasts. Instead of Liberty’s re-creations, Mutual promised live coverage from a different ballpark every day, Monday through Saturday. The broadcasts were blacked out in the 10 major-league markets. That played to Mutual’s strength; it boasted the largest network, but most of its 400-plus affiliates were in smaller cities and towns. Mutual lacked the lucrative soap operas that dominated the daytime schedules on other networks. Afternoon baseball would fill those hours. By June, 312 stations had signed up, and the number kept growing, eventually to more than 450. Mutual’s gamble was paying off. The hellish schedule opened new opportunities. As Mutual’s star announcer, Helfer called five World Series on radio from 1951 through 1955, plus the 1957 Fall Classic on television; four All-Star Games on radio; and four more on TV. 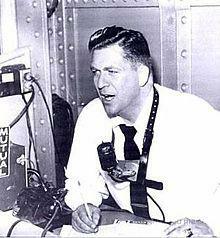 In 1951 he broadcast six of the highest-profile sports events: baseball’s All-Star Game and World Series, the Giants-Dodgers playoff with Bobby Thomson’s “Shot Heard ’Round the World,” the Army-Navy football game, the Rose Bowl, and the East-West college football all-star game. He worked seven Rose Bowls and one Orange Bowl, the Indianapolis 500, and basketball at Madison Square Garden. He began a long run as master of ceremonies for the New York Downtown Athletic Club’s annual Heisman Trophy banquet. The club eventually awarded him an honorary Heisman. Mutual’s Game of the Day crowned its success and became the exclusive daily network broadcast in 1952, when Falstaff beer began sponsoring the games. Falstaff had previously sponsored McLendon’s Liberty network; its defection helped drive Liberty into bankruptcy. McLendon sued major league teams, unsuccessfully, for freezing him out. Falstaff brought along its St. Louis Browns announcer, the outrageous Dizzy Dean, to join Helfer on some broadcasts. That made for a crowded booth with more than a quarter-ton of announcers, not to mention two gigantic egos. “They were both prima donnas,” said Falstaff executive Alvin C. Griesedieck. No surprise that they couldn’t stand each other. They traveled on separate planes and arrived at the ballpark in separate cabs.10 One day Diz broke into a chorus of his favorite country song, “The Wabash Cannonball,” and Helfer growled — on the air — “If you want to be a damn comedian, go to Las Vegas.”11 But they sold beer, and that’s all that mattered to Falstaff. Helfer stuck it out for five years and an estimated 4 million miles. In September 1954, he unpacked his suitcase for the final time, saying his doctor had ordered him to quit. He had lasted longer than any of his successors would. Midway through the 1955 season, Helfer returned to the Dodgers broadcasts when the popular Connie Desmond entered treatment for alcoholism. Helfer was again the second banana, this time to 27-year-old Vin Scully. It was evidently an uneasy partnership. “Great pipes, but hard to work with,” said Jerry Doggett, who joined the broadcast team the next year. “If Al had been less temperamental, he might have gone West with Vin.”13 Instead, Doggett made the transcontinental transition when the Dodgers moved to Los Angeles after the 1957 season. The loss of the Dodgers and Giants left New York without National League baseball. WOR-TV tried to fill the void in 1958 by importing Philadelphia Phillies games, with Helfer at the mike. That was about as popular as you’d expect. Helfer’s last network baseball broadcast was the 1958 All-Star Game, his fourth straight for NBC-TV. He went to Houston in 1962, adding a big-league voice to the expansion Colt .45s. When that gig ended after only a year, Helfer and Ramona moved to Denver, where their daughter Mona was studying music. He found work as a newscaster and football announcer for the Inter-Mountain network, and called some college and pro football games for ABC. One more shot at the majors came out of the blue in 1968 when the Kansas City Athletics moved to Oakland. The A’s number-one announcer, Monte Moore, welcomed him; Moore had listened to the Game of the Day while growing up in Oklahoma. Back in the big leagues at 56, Helfer still knew how to go first class. “We would go out on the road and into fine restaurants,” Moore remembered, “and this big fellow would tell the waitress to just give him raw meat, ‘warm it up a little, but not very much.’”14 But Helfer struggled on the air. His eyesight had deteriorated, and Moore sometimes had to signal him whether a fly ball was caught in the outfield. Finley, who changed announcers and managers like he changed shirts, thought Helfer lacked enthusiasm. He was let go after two years. The last stop in Helfer’s four-decade career was KRAK in Sacramento, where he served as vice president for news beginning in 1970. Ramona died of cancer in 1972, and he married a Sacramento woman, Margaret Grabbe. Helfer’s one remaining connection to the big time was the annual Heisman dinner in New York. He emceed it for the last time in December 1974. Six months later he died of cancer on May 16, 1975, at 63. This biography was reviewed by Jan Finkel and fact-checked by Chris Rainey. 1 Roger Kahn, The Era (New York: Houghton Mifflin, 1993), 288. 2 David J. Halberstam, Sports on New York Radio (New York: Masters, 1999), 283. 3 Ron Bergman, “Jim Woods Fails to Fit in, Feels the Blade of Finley’s Trusty Axe,” The Sporting News, December 15, 1973: 56. 4 Curt Smith, Voices of the Game (South Bend, Indiana: Diamond, 1987), 135. 5 “On the Air Lanes,” The Sporting News, November 1, 1945: 19. 6 Halberstam, Sports on New York Radio, 232. 7 Jonas was a tiny man. Once, when he and Helfer walked through a hotel lobby side-by-side, a bystander remarked, “My God, here comes Jonas and the whale.” Robert Gregory, Diz (New York: Viking, 1992), 119. 8 Hy Turkin, “1,950 Local Sponsors, 312 Stations for ‘Game of Day,’” The Sporting News, June 14, 1950: 11. 9 Anton Reminih, “Al Helfer Sees a Game a Day and Likes His Work,” Chicago Tribune, June 14, 1952: C-1. 12 Robert Cole, “Al Helfer and the Mutual Game of the Day,” Baseball Research Journal 10 (SABR, 1981), http://research.sabr.org/journals/al-helfer. Cole’s article includes a transcript of Helfer’s play-by-play. 13 Smith, Pull Up a Chair: The Vin Scully Story (Washington: Potomac, 2009), 47. 14 Halberstam, Sports on New York Radio, 282.